The Keychoc INFINITY Series chocolate tempering machines have been designed to serve as the backbone of a versatile, modular chocolate production system. When combined with the INFINITY Depositing Attachment or the INFINITY AML Automatic Moulding Line , you can easily turn your INFINITY into a full-scale chocolate production line for chocolate moulding. The Infinity Series is entirely made in the UK. The most recent addition to the range is the INFINITY AX, a fully automatic, continuous, chocolate tempering machine, designed specially to work with inclusions up to 10mm in size. It can handle batches from 12kgs up to 60kgs and is extremely easy to clean. Quite simply, we believe the Infinity AX is the best chocolate tempering machine in its class and we’d be very happy to show you why! 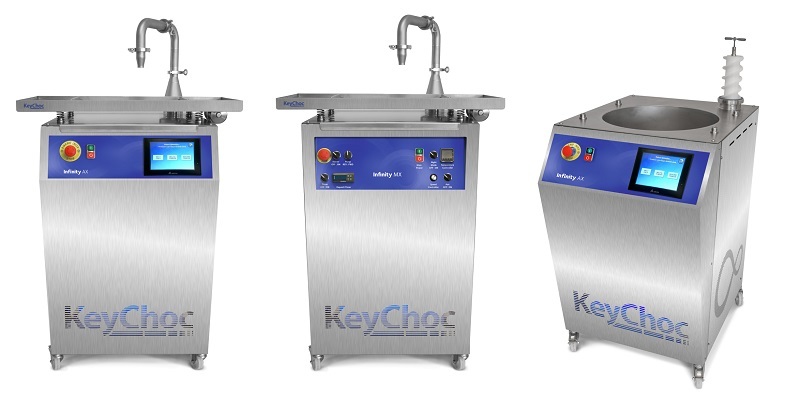 The KeyChoc standard range also includes table-top chocolate melters, large melting tanks up to 3000kgs, batch chocolate tempering tanks, wheel moulding machines, vibrating tables and cooling tunnels. KeyChoc chocolate machinery has been developed to suit the needs of both smaller artisanal chocolate producers as well as medium-sized, industrial chocolate manufacturers. Designed with a meticulous attention to detail and manufactured to precise standards, KeyChoc machines combine solid engineering with a wealth of carefully thought out features, and all at sensible prices. All our chocolate machinery can be seen at our Showroom in St. Helens, Merseyside and we would be very happy to arrange a demonstration for you.